Agile is built on a foundation of continuous improvement: So you need to learn from and adapt your performance to keep improving, but you need one thing - accurate and comprehensive data. 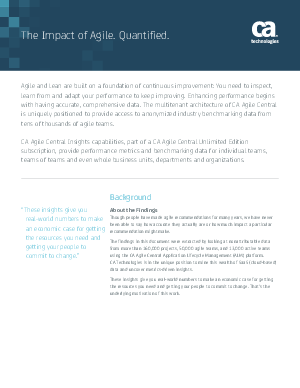 Did you know that CA Agile Central is uniquely positioned to provide access to anonymized industry benchmarking data from tens of thousands of agile teams? If not, then read this solution brief to learn how you can evaluate your own business on metrics like predictability, productivity, and quality for continuous improvement.